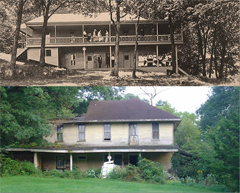 Cedar Springs Hotel, then and now. A 125 year old hotel overlooking the Cedar River in Linn County will be demolished this week. The Cedar Springs Hotel was built in 1884 by a railroad company for workers in a nearby rock quarry. It was purchased by Adolf Biderman in 1914. Pat Biderman, Adolf’s granddaughter, is the current owner of the property near Palisades-Kepler State Park. She says the building became uninhabitable in the 1970s and was basically destroyed in last year’s flood. “It was a beautiful building,” Biderman said. “It was a two-story (hotel) with two porches facing the river and the main yard.” The long vacant hotel is one of 18 flood damaged properties being demolished this week. Biderman says she remembers days when the hotel was bustling with activity. “People had their wedding receptions out here. Cornell (College) would have a day every spring when students would come out and play baseball and have picnics. There was just an awful lot of activity going on out here in the summertime,” Biderman said. About 20 years ago, Biderman sought help to preserve the 11-room hotel, but didn’t have any luck.